This disc was first advertised for sale in Acorn User magazine in October 1988. 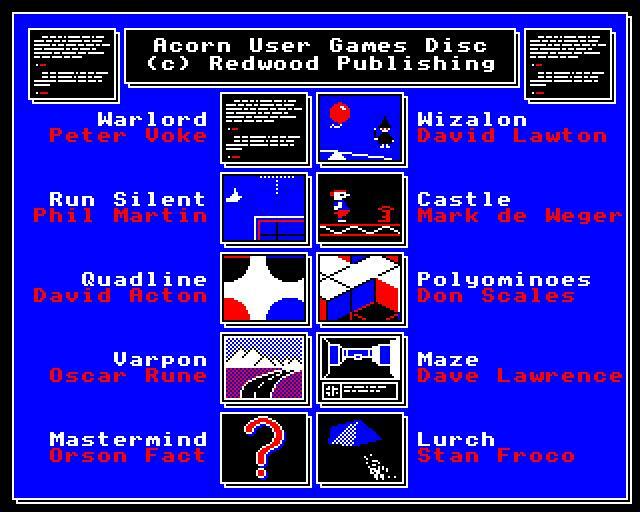 It consists of previously published Acorn User games: Warlord (Peter Voke), Wizalon (David Lawton), Run Silent, Run Deep (Phil Martin), Castle of Nightmares (Mark de Weger), Quadline (David Acton), 3D Pentominoes (AKA Polyominoes) (David Lawrence/Don Scales), Race to Varpon (Oscar Rune), Maze (David Lawrence), Mastermind (Orson Fact), and Lurch (Stan Froco). Orson Fact is a made-up name. It is an anagram of Stan Froco. All of the one-line games previously appeared in the Acorn User "Acorn Abuser's Diary" section, but at time of writing it is not known which issue (if any) the Mastermind game was published in.